You can now view the Power Point and the recording of NASDCTEc’s recent webinar on the Career Pathways Effect: Linking Education and Economic Prosperity – A Conversation with the Bookâ€™s Team Leaders. 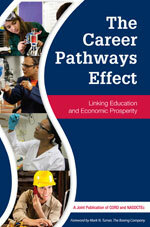 Jointly published by CORD and the National Association of State Directors of Career Technical Education Consortium (NASDCTEc), The Career Pathways Effect meets a need for evidence-based support for concepts and principles associated with Career Clustersâ„¢, Career Pathways and Programs of Study, and provides more uniform implementation across the nation. The Team Leaders of the book discussed the basis for developing the book; the bookâ€™s organization, and ways the book can stimulate conversation on topics such as new models, collection of evidence-based data, and how the successes achieved by Career Technical Education can improve all of education. This entry was posted on Friday, December 14th, 2012 at 7:56 am	and is filed under Webinars. You can follow any responses to this entry through the RSS 2.0 feed. Both comments and pings are currently closed.